RONALDO EARNS PORTUGAL 1-0 WIN AS MOROCCO BOWS OUT! Cristiano Ronaldo powered-home a fourth-minute header to give Portugal a 1-0 World Cup victory over Morocco that took them top of Group B on Wednesday and meant the unlucky North African side become the first to be eliminated from the tournament. 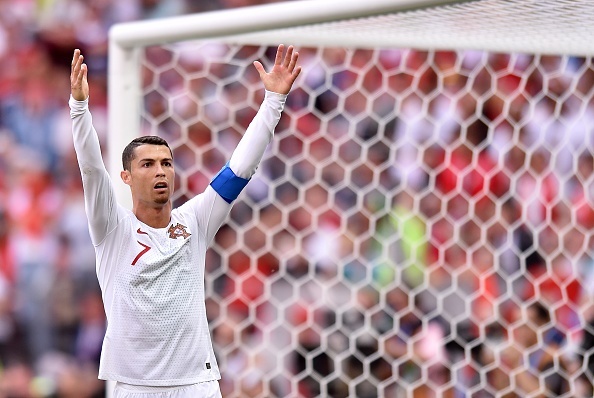 Ronaldo's fourth goal of Russia 2018, following his hat-trick in the 3-3 draw with Spain, took the European champions to four points. Iran have three points and Spain one ahead of their meeting later on Wednesday. It was his 85th international goal, taking him beyond Hungarian Ferenc Puskas's European record, with only Iran's Ali Daei ahead of him on 109. Morocco were the dominant side in the second half and Portugal were grateful to goalkeeper Rui Patricio for a fantastic diving low save to touch clear Younes Belhanda's sharp header, while Medhi Benatia blazed over the bar when he should have scored after an hour. However, Portugal held out and go on to complete their first-round against Iran while Morocco face Spain, both on 25 June.